"PVE" is a new face in the U.S. construction equipment market. Their superior quality products were first introduced at the ConExpo Show in March 1999. In the short time since this introduction, PVE has earned the same reputation in the U.S. that they long enjoyed around the world. They are known for building high horsepower vibratory pile driver/extractor systems that get the job done reliably even in the toughest driving conditions. The PVE factory, corporate, and engineering headquarters are located in Sliedrecht, Holland, near Rotterdam. After initial testing, completed units are shipped to the PVE-USA facility in Jacksonville, Florida for final testing and dispatching. The PVE-USA office is fully staffed to provide technical assistance in addition to service and parts support. 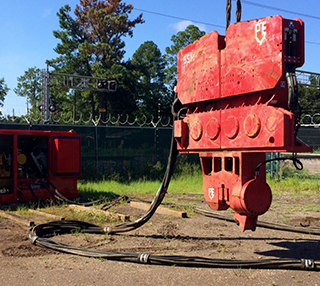 Hammer & Steel, Inc. is excited to offer a complete line of PVE products and accessories including standard frequency vibratory pile driver/extractor systems as well as high frequency systems and high frequency/variable moment systems for sensitive site conditions. PVE has recently patented a new high frequency/variable moment vibratory driver/extractor system. This system can be used on sensitive sites without transmitting damaging vibrations to surrounding structures and utilities. PVE offers a full range of driver/extractor systems up to the massive model 200M. 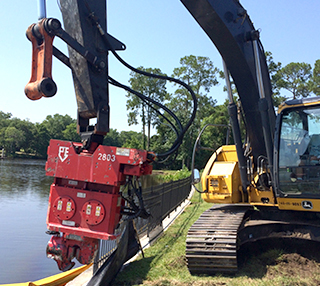 Accessories include clamping systems for sheet piling, beams, timber piles, concrete piles, and caissons. Each PVE hammer system includes unique design and engineering features, such as forced lubrication of exciter transmissions, special machining processes, and heat treatment of many hammer components. Only the very best components are used within the PVE systems, including Rexroth pumps and valves, Volvo and Cummins diesel engines, and high quality bearings and gears. Each power unit is silenced and includes a full complement of safety shutdown circuits for protection of the diesel engines and hydraulic systems as well as a unique warm-up circuit for operation in cold weather conditions.